Thailand’s True Corporation has secured a majority investment in Crave to launch an industry-changing short-term rental model. London – April 8, 2019. Crave Interactive, the world-leading developer of cloud-based digital guest service solutions for hotels, today announced a major investment by True Corporation, Thailand’s leading telecommunications provider. The deal provides a majority investment from True Digital & Media Company Limited, a wholly owned subsidiary of True Corporation Public Company Limited. The investment will help to drive an innovative rental model that will accelerate the adoption of digital guest service solutions to replace antiquated paper solutions in hotels. Crave will be making a significant investment into the Asia Pacific market, and will be leveraging synergies with True’s technology, market positioning and partnerships in the region. It will also invest further across the Americas and Europe, where it is already well-established as an industry leader. Crave will be utilizing the investment to double its research and development spend, solidifying its position as the leading vendor of in-room tablets with world-class technology and development capabilities. 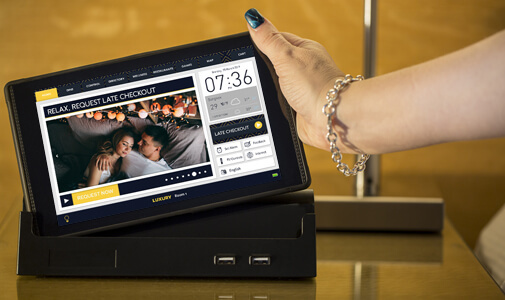 “We see incredible opportunities in the convergence of voice, entertainment, communication and smart controls to develop solutions that delight guests and help hotels deliver top-class services,” said Crave Founder and CEO Gareth Hughes. Crave’s goal is to make paper directories and in-room marketing material obsolete with digital solutions that elevate the guest experience and make hotels money. Up until now the cost of making the switch to digital has been high for hotels, restricting the sector growth, but the investment from True will enable Crave to launch a game-changing low- cost, low-risk short term rental model, enabling more hotels to make the transition.